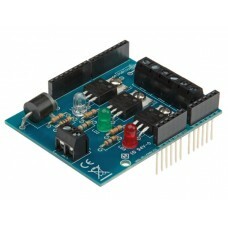 The Velleman RGB Arduino Shield Electronic Kit is a unique project that allows your Arduino to control three dimmer channels. This kit uses the Arduino digital output pins D3, D5 and D6 to generate PWM signals that control three RGB output channels. Each channel has corresponding screw terminals for connection to an LED strip or other load. It can be configured for a 2A load when using the Arduino power supply or a 6A load when using an external power supply via screw terminals. There are Red, Green and Blue LEDs to assist with debugging. 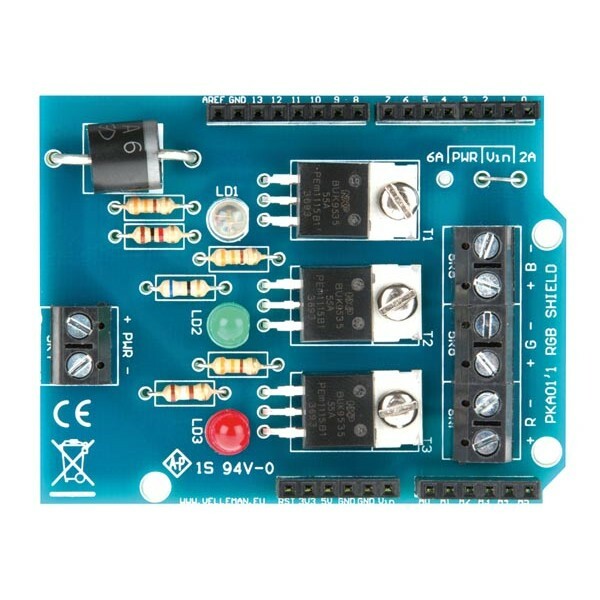 The RGB Shield is an electronic kit that requires basic soldering skills.